In this article we will help you find the best straight razor kit – a perfect item for those who want to get started with traditional (wet) shaving. These set also make an ideal Birthday, Father’s Day or Christmas gift for friends, husband or lovers, who have been daydreaming of getting the perfect shave. In shops today there are items with five blades, ones that vibrate and even a few that have shaving foam coming out of a pressurized container. These gadgets are accompanied by huge advertising campaigns that promise you an even better shave than the previous model that was released 6 months before. These have to be better than using the same kind of equipment that your grandfather used, right? The latest is always the greatest? Does this really mean that traditional way of doing things becomes obsolete? Classic shaving with a open edge razor is all about the return to the roots of the shaving experience. Wet shaving is about your enjoyment and satisfaction in getting the best shave possible. If you do not have the time you can shave instantly with traditional equipment but aren’t you worth a little extra time to savor the feeling of massaging the warm shaving cream on your skin using a gentle shaving brush? A great cutthroat razor shaving will turn your daily routine into an experience of sensual enjoyment. It can be equated to eating a well made gourmet meal, riding in an insanely expensive car or soaking in a hot bubble bath after a long day at work. What a way to start your day! We owe it to ourselves to go for the whole experience. Just like you would not fill up the tank on a classic sports-car with water or eat fine cuisine with plastic forks and knives, you cannot truly get into the straight-edge shaving experience with mediocre equipment. That said, this review and buying guide written in 2018 will take you back to the traditional open blade sets and the essential items that it should include. You will soon see that the market is flooded with all kinds of straight-cut razor shaving sets from different manufacturers. Dovo, Bevel, and Gibson all advertise themselves to be the best, but are also unique and different in design, look and content. Below are the four items that every straight edge shave set should contain. This is arguably the most important item in any good set. It is critical that the blade is of top quality, affordable, easily available and simple to use and maintain. The blade in the set you choose should be professionally honed to provide the best possible start in shaving with your new outfit. They are judged by the steel grade used in the construction of the blade, the shape and size of the blade as well as the scale (handle) material. The blade tip shape can either be round nose or straight nose design. For a starter kit, you should set aside in the neighborhood of $40-$60 for the razor itself. The size of the beginner blade should be 5/8 inches as it is more comfortable and easy to hold while learning the basics of the art. Most persons assume that strops are just simple accessories. Well, they are. However, they are also highly functional and without them, shaving with traditional blades would not be nearly as effective. Strops are used to straighten and polish the steel of the blades. Strops are diverse in the materials they are made from and the finish they feature. There are those that come with canvas finishing, those with linen and a compressed felt finishing and of course those that have leather finishing. However, even with these similarities, each strop has a set of unique characteristics that give it life. There are strops of three types: paddle strops, loom, and hanging strops. All do the same thing – straighten the edge of a blade, but a paddle and loom strops are slightly less common. Hanging strops are the most popular though they had to be fixed to an immovable object and stretched out tight when in use. Strops come in two sizes: 3” and 2” each with its pros and cons. In the case of a 2” strop you will need to make x patterns when honing the blade; with a 3” strop, you can use a flat stroke. They made their first debut in the 14th century and have ever since remained an essential element in quality shaving. A quality shaving soap or shaving cream features a high-fat content (tallow or vegetable) and glycerin. The glycerin from plant oil is useful as it helps to retain water keeping the skin hydrated. The fat in the soap provides for lubrication and protection while shaving causing the blade to glide over your skin with ease preventing minor nicks. So yes, just in case you were wondering, shaving soap has many differences from your average shaving foam from your local grocery store. There are boar shaving brushes, horsehair brushes, synthetic brushes and finally yet importantly, badger brushes. The latter, badger brushes have been in use for two centuries and come in different grades including silver tips, super, best and pure. Ok, lets get to it – here are a number of great razor sets, if it is the best, that depends a bit on your preferences and budget. If you are in love with shaving, then GB Buckingham rings a bell for being a very desirable item. This company is renowned for its exceptional quality products which most shaving enthusiasts would agree. Talk of good quality products and you are talking about this Straight American set whose job is simply to give you a wonderful shave. Despite the fact that best manufacturers are considered to be from either Germany, France or Japan, GB Buckingham and Sons have invested huge efforts in making America great among the nations producing high-quality shaving set. With their square point blade, they are definitely on point and any shaving enthusiast will definitely like their products. Different from other sets, this comes as a set that contains the essential ingredients for a truly great shave. The strop is great quality and makes for easy sharpening. This razor is designed with steel which is hardened to HRC 61, which is of high quality and good durability, being manufactured in the U.S.A.
Something else outstanding with this razor is that it comes with a lifetime warranty, this being an assurance of the quality of the product and adds confidence to the users. If you are looking for a change in your grooming experience and substitute the unsatisfying experience with a smooth shave that will keep you with a smile through the process, then this could be all you need. This set is built with many of the best features, it is easy to use, and it is durable. With this features and its ease of usage, this set is recommended to any beginner (even though it has a square point) since it does not require experience, unlike other sets. If you are new to shaving, then you should get one of this for a lasting perfect shaving experience plus performance is guaranteed since this set comes with a warranty. Currently stumbling along with a blade that just isn’t right for you? Can’t get any satisfaction? Well, if you are experiencing this then you have not met the Parker SR1 Kit. This beauty offers you a new and refreshing shaving experience and could easily erase all your previous disappointments in the traditional shaving game. This could explain why the SR has increasingly gained popularity in many barbershops over the years. The purely stainless steel gem and durable construction could also have something to do with its reputation. Alternatively, it could be due to its Shavette style clip mechanism that has made changing of blades quite fast and easy. Whatever the reason for its increased fame, the manufacturers of this set are renowned for their quality products. Its 100 shark super and stainless steel blades are designed for use by barber type razors. They fit perfectly into any straight edge razor that uses a double edge blade. Each of these blades has been precisely sized with precision – hence delivering the best quality shave possible. This set also includes 100% badger brush, an ideal deluxe chrome stand, and up to 100 sharp blades. Parker also contains a stainless blade arm and handle which are of a high quality and could be used for both home shavers and barbershop use. It is designed with a Shavette style snap lock which is essential in securing the blades in place alongside other useful features that are only found in high-quality models of this kind. This set could be perfect for beginners since it is simple for use by anyone. Hence, if you are a beginner interested in getting the best traditional shave, then you should consider going with one of this. Having a grown out beard requires some special maintenance. Perhaps you don’t see how you can turn your scruffy and ragged face baby smooth in the quickest time possible. Well, there is a solution. A.P. Donovan Straight Razor is considered the top solution for maintaining a grown beard by many of the “Pros”. If the quality of the shaving equipment and performance is something to go by, then this baby has it all. With this latest masterpiece manufactured by A.P. Donovan, your shave is kept smooth and close. Regardless of how you balance the razor in your hand the balance highly depends on the weight ratio that exists between the blade and the handle dependent. Being constructed with a blend of mahogany wood and steel, you will be amazed at how the balance is attained successfully. This blade is made of Japanese steel which is carbon tempered enabling it to achieve a hardness of up to 64HRC. This is very important in allowing production of extremely sharp blades for an effective, gentle and close shave. The shaving brush in this package is made of materials which are of high quality. For instance, the hair from the badger is fixed to the handle made from mahogany wood and stainless steel with a style which gives it a beautiful look. This set comes in a decorated real wood box. With a foam insert in this box, you can protect the handle and blade from any form of scratch. This set could be used by an experienced user in straight shaving for excellent quality shaves since it performs very well. If you have never had previously used an open razor then you can be sure to have missed some of the best shaving experiences. Using this one could be quite fulfilling and satisfying, and that is why all men with a beard should try it out since the shaving experience could be far much better as compared to electric shaving. Even though cutthroat razors are very useful for perfect grooming, not all of them possess the best qualities. It is a fact that only a few of the shaving sets available today have the best features to give you a shave of your desire. While this is true, the “shave ready” set meets all the conditions necessary to being classified among the few sets of high quality. Nearly all the elements contained in the set are of high quality which implies that you will experience less frustration and great ease when using them in shaving. The best part of this set is that it is not like other sets which sometimes contain a razor that is of good quality and well performing – but all the other items are of lesser quality leading to potential disappointment. It comes with an 8-page beginner guide booklet on traditional shaving and how to perform the stropping. The set contains a 6/8” round point efficient cut-throat razor that is sharpened by experts. It offers the best shave which gets you to feel the closeness of shaving using this classic tool. Apart from being made of carbon steel, it has been kiln-hardened with fire for durability. Comes with a lovely, classic slipcase (box) for proper storing of your gear. The set comes with a GB Buckingham and Sons 3″ synthetic strop for stropping your cut-throat blade, makes it super sharp for your daily shave. The set comes with a high-quality satin tip white synthetic shaving brush with slipcase for storing. Lifts hairs so you will get a close and smooth shave. It also contains Blades Grim shave soap that has earned plenty of praise and is quite excellent in producing long-lasting lather to ensure the perfect smoothness is achieved. Antiseptic after-shave from Blades Grim that prevents the growth of disease-causing microorganisms. 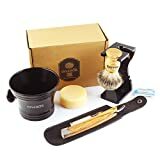 This set of shaving equipment great for anyone with experience who wants to get shaving with a minimum of fuss as all is ready to go right out of the box. This shaving set is among the most famous sets that you could get for perfect shaving. It is packed with items with the best quality which has made many men to appreciate the zen of open blades. The most exceptional item you will find in this deal is its razor which is manufactured by Gold Dollar. This 3” by 6/8” carbon steel blade makes it a breeze to easily switch blade angles which is very useful for both experienced shavers as well as beginners. The fact that it comes already sharpened by professionals is a big plus. This razor is designed to have a long lasting life even if used on a daily basis. It is also intended to offer a good firm grip making it easy to maneuver during the shaving process. With the round point being the best feature for beginners, this set makes your shaving enjoyable. This set is also packed with a Blades Grim pre-shave, quality soap, and excellent aftershave oil. If you want to achieve a great shave then obviously you need to have the best soap. The good thing is that this set comes with exactly what you need. What makes this soap significant is that it can produce quality lather within a short time and its natural smell gives the perfect scent. Having a good soap is not enough, and that is why the set also contains a synthetic shaving brush made by Satin Tips which performs very well. Also, with a genuine leather strop, you can sharpen your blade whenever you need. The Shave soap from Blades Grim is useful in preparing and securing your skin with the needed moisture which keeps the skin soft. The Blades Grim shaving soap in this set contributes to a lasting moisture which is helpful for keeping your skin moist until the next time you shave. Despite the fact that this set might not be the best for beginners, they could also make use of this set using the instructions that come with it. This deal, however, is perfect for experienced shavers. Regardless of the type of product you are looking for, if it has a brand name Colonel Conk on it, then you should know that it’s worth your money since satisfaction is guaranteed. Shaving using an open blade is considered luxurious by most people. Just as you would not fill your luxurious sports car with bogus engine oil, a quality razor should not be surrounded by a set of inferior equipment. The Colonel Conk Model 2316 set manufacturers know this pretty well, and that is why in their kit, they include only superior and quality close shave products as compared with other sets. Apart from containing a carbon blade that is very easy to sharpen, this deal also includes an acrylic handle which offers you a balanced wrist control. Also in this set are natural products which are produced from essential oils which play a significant role in soothing, moisturizing and nourishing your skin. As it is well known, moisture plays a critical role in maintaining your skin in good care. This set also has a pre-shave oil which is very useful in preparing your skin before you begin shaving. Many experienced wet shavers will attest to the fact that, the success of your shave is mainly dependent on your level of preparation before starting shaving. The Rio Grande Lavender shaving cream that is also in the set helps in smoothening your skin for smooth movement of the blade during shaving. The functionality of shaving cream can never be underestimated since it is useful in avoiding cuts that could result from roughness on the skin when shaving. With Rio Grande Lavender after shave lotion also included healing any nicks that you might have incurred when shaving is made simple. It comes as not ready to shave, however with a few rounds with the strop you should be able to use it. Despite the fact that this set comes as not shave ready and could be used by beginners, it might not be the best for them. This set might works perfectly with experienced users with good technique in shaving and sharpening. Are you interested in getting the same feeling that your forefathers experienced when shaving during those early days? Yes, this could be you since in the past the use of traditional blades was the norm before electric shavers came along. Well, the Apothecary set has made a move to reclaiming the old traditional art which was perfect then and is perfect today. Perhaps you are thinking, what’s special with this deal? Well, the manufacturers were very considerate in picking the contents that are included in this deal. Among the contents that you will find in this kit is a shaving brush that is designed purely with badger hair. This brush is useful in applying shaving soap or cream to the face during shaving. Being made with 100% badger, you get to experience soft and luxurious feeling each time you will be shaving. This kit has the perfect sturdy acrylic stand that can hold both the razor and brush which are designed to fit your brush perfectly. The set contains a 5/8” Giesen & Forsthoff which entails a carbon steel blade and long-lasting black plastic handle. The Apothecary mug contained in the kit is classically designed to hold a right amount of lather and keeping it warm throughout your shaving exercise. This mug could also be a great way that of storing your shaving soap. The kit includes a Large Country Uuncle shaving soap which contains up to 40% moisturizers. This soap also contains aloe vera which can soften any beard regardless of the hardness. This soap is also manufactured with 10% glycerin and mango, cocoa butter and emollient shea offering a comfortable shave. With these great features, this kit has proven to be quite useful to users who have been shaving using an open blade for a while and may not be the best for beginners. Life is characterized by a series of stages. Everyone has to start from somewhere and finally get to the other end. From being a young boy to becoming a man entails a complete transformation. After becoming a man, a lot is expected from you which can be termed as responsibilities. Apart from being responsible for many other things, mostly you are accountable for your cleanliness and how presentable you are. It is possible to tell how a man has it together from his facial appearance. Nothing comes easy and even maintaining your facial hair could be hard since it entails a blend of skill, practice and pleasant experience to achieve the very best results. 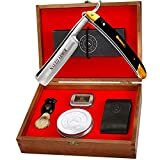 Fortunately, there is now a great shaving set that is quite effective for beginners that are sensibly called the “Straight Razor Beginner’s Shaving Set”. This kit could be the only one that can be used by a beginner with much ease to get the job done. If you need perfection in wet shaving, then you need to have one of this since it has the best contents to keep you on the right path in shaving. With all these accessories that comes with this kit such as the black handle open razor, the double side strops made from leather, quality shave brush, strop paste and soft shaving soap with a pleasant scent your shaving will be quite comfortable, and you will be satisfied. Included is a cowhide leather strop that measures 19.75” by 1.5” and quality Kohl strop paste which is manufactured in Germany. The set also contains good quality shaving brush and Marvy shaving soap which is manufactured with a light almond scent which leaves you with a fresh smell and a lather which can last throughout your complete shave. This kit is very suitable for beginners since it is easy to use and comes as not shave ready hence they can use it to practice sharpening skills before making any further upgrades. Over the past years, men have been misled into believing that fast convenience in most of what we do should be the norm. The effect of this is that nowadays many people have become less independent and more hooked by marketing. Time has come where men have to prove how gentle they can get, as the name gentleman does not just come free. You know that you are a gentleman if you can name the blade that you shave with. The quality of the blade included in this kit is outstanding for its reliability and sublimely great performance. There are many reliable products for perfect shaving whose quality is guaranteed from the famous Frontiersman. If there are geniuses involved in the putting together of great kits, then these guys are among the best. This kit comes with up to 10 super stainless blades, a stand for drying and field shave canister which can be used over and over. 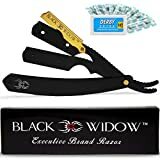 These great features make this shavette style razor among the best for shaving especially for beginners and people who do not want to spend any time stropping and honing. This shavette style product from Parker has a “barbershop style” that allows you to change out the razor blades as required so you don’t have to worry about stropping and honing your blade. Just switch out your favorite Double Edge blade for a new, sharp and close shave. Stainless steel arm and push-style blade holder make it a breeze to swap fresh blades. The Parker PTB has a rounded point of the blade compartment to minimize the chances of nicking yourself while shaving. The Parker Black Badger Brush that comes alongside the other contents in this kit is quite useful because it can hold large quantities of water as compared with other brushes, which is very important for wet shaving. Comes with drying stand. It also comes with imperial oil which is used for pre-shave to keep your face safe. This oil is manufactured with a mixture of essential oils that ensure your face is well secured from any form of skin redness or even razor burns. The kit contains imperial glycerin soap which is tailored to ensure that your face is safe away from the attack by rashes and abrasions. This soap is quite useful and if you make use of it on a regular basis and certainly makes shaving even more fun. The Frontiersman set is accompanied with a pack of useful accessories for everyday shaving. This kit is good for both beginners and experienced shavers, and anyone interested should obtain one with confidence since satisfaction is guaranteed. This Dovo 5/8” half hollow straight razor has a place at the top of the class due to its excellent quality and long lasting life placing it among the favorites for beginners getting into wet shaving. What makes this product famous is that it is simple to use and handle during the shaving. The fact that this set is manufactured in Germany gives it a plus since most shaving products from Germany are known to be of great quality. Besides the quality, the Dovo is characterized by an almost ideal of balance and handling essential in getting a smooth, nick-free shave. Experienced shavers know that one of the keys to a successful shave is proper preparation. This is why as leading experts in shaving, The Dovo includes in their set a royal shave PB2 badger shave brush and also a top grade shaving cream. With all these useful items that the set comes with, you will enjoy your shaving experience since all the necessities are already provided. This set includes alum pen which is used for the treatment of minor nicks and the small cuts that you might occasionally experience when shaving. It includes a royal shave strop designed using latigo leather which has a handle of 3” a perfect item in helping to keep your edge sharp. The most significant feature that this set has is the Dovo 5/8” half hollow straight razor. The set also comprises a natural wood stand which is very useful for firmly holding the two items in place during your shaving ritual. This stand proves to a great help enabling you to avoid misplacement of items, thus maintaining your focus on the goal of achieving the perfect shave that will leave you with a smile on your face. This shaving set is useful to both beginners and experienced shavers since it contains all the necessities that a beginner would need plus it has a pack of suitable features for any regular shaver to enjoy. You might want to pick up some extra items with your kit to make it even better and/ or personalized to your specific needs – even if you have found the best kit for your needs. The decision of which shaving kit you should prefer should not hinge on the fact that a shaving set comes with or without a travel case. However, if it does, count this as a plus especially if you are one who is on the road often. Some sets will feature honing stones (whetstones) for sharpening the blades. It is important that everyone, beginners especially, learn the art of blade honing. It may seem intimidating, but learning with step-by-step tutorials, will be a walk in the park. The marketplace has a wide range of straight razor shaving kits from a variety of companies. This great choice of features, quality and of course price can make your choice a little confusing. We hope the information provided has helped you to be well informed before taking on the challenge and getting the shaving kit that fit your personal preferences and needs. Best of luck as you take your first dip in traditional shaving!